001957 Precision Circlip Plier Set - Tool Roll Tool roll made of hard-wearing polyester fabric With practical, adjustable quick release fastener Four common Precision Circlip Pliers for highest requirements ATTRIBUTES: Barcode: 4003773050056 Net Weight: 665g Style: Precision Circlip Plier Set - Tool Roll ITEM CONTENTS: 1 Precision Internal Circlip Plier 4811J1 12 - 25 Ømm Straight Tip 1 Precision Internal Circlip Plier 4811J2 19 - 60 Ømm Straight Tip 1 Precision External Circlip Plier 4911A1 10 - 25 Ømm Straight Tip 1 Precision External Circlip Plier 4911A2 19 - 60 Ømm Straight Tip. Precision Circlip Plier Set - Tool Roll Knipex 001957 4 Piece Net Weight: 665g. 001957 Precision Circlip Plier Set - Tool Roll. Tool roll made of hard-wearing polyester fabric With practical, adjustable quick release fastener Four common Precision Circlip Pliers for highest requirements. Precision Circlip Plier Set - Tool Roll. On rare occassions this may not be possible due to circumstances outside our control. If this is the case we will contact you to explain the reason for the delay. Wahankh Pty Ltd trading as Blue Bar Industries and Aussie Online Bargain Warehouse is an Australian and Operated business and abids by Australian retail laws. We are continually expanding our range and offer our customers a quality product at a reasonable price. A large selection of our products are manufactured under our own brand "Blue Bar" and all other products come from reputable manufacturers. Wahankh Pty Ltd Blue Bar Industries Aussie Online Bargain Warehouse Find us on Google. Wahankh Pty Ltd trading as Blue Bar Industries acn: 167 220 902 We are an Australian owned and operated company located in Caboolture QLD. Get Supersized Images & Free Image Hosting. Create your brand with Auctiva's. Attention Sellers - Get Templates Image Hosting, Scheduling at Auctiva. The item "Precision Circlip Plier 4pc Set-Tool Roll Knipex 001957 Trade Quality Electrical" is in sale since Monday, May 14, 2018. 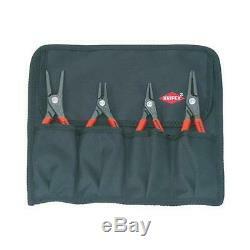 This item is in the category "Home & Garden\Tools & Workshop Equipment\Hand Tools\Pliers". The seller is "blue_bar_industries" and is located in Caboolture.